Run for Your Life Mr. Squirrel! Yoshi and I were walking the other day and two squirrels were going at one another (fighting or mating, I'm not sure). Anyway, we went over to the tree to check them out. As we glanced up, the two of them fell out of the tree and almost landed right on top of Yoshi (they fell from about 15 feet up). 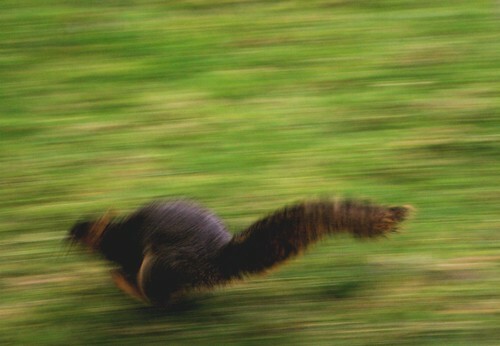 I have never seen squirrels run that fast before. Yoshi almost got 'em. I had the camera out to take a picture of them fighting and just caught this one as it zipped away.